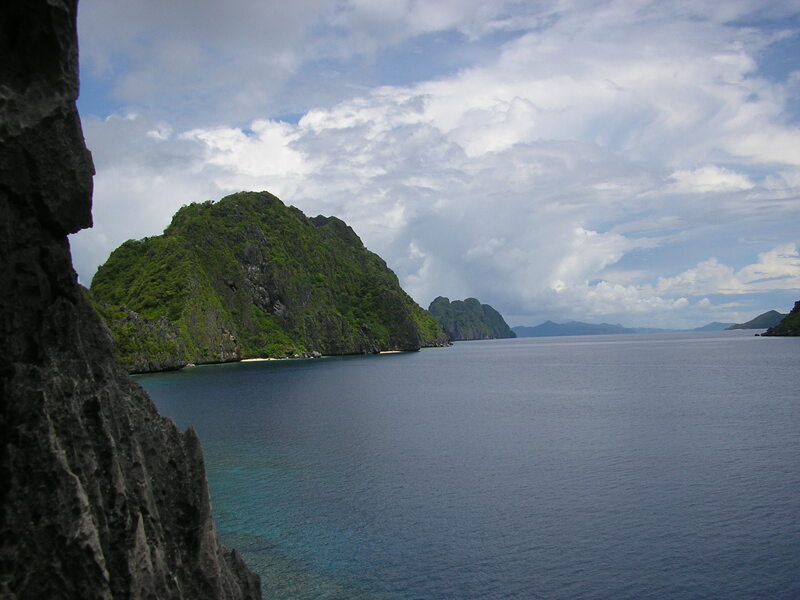 El Nido – so distant, opulent and perceived to be luxurious, a popular destination many tourists have been raving to explore. 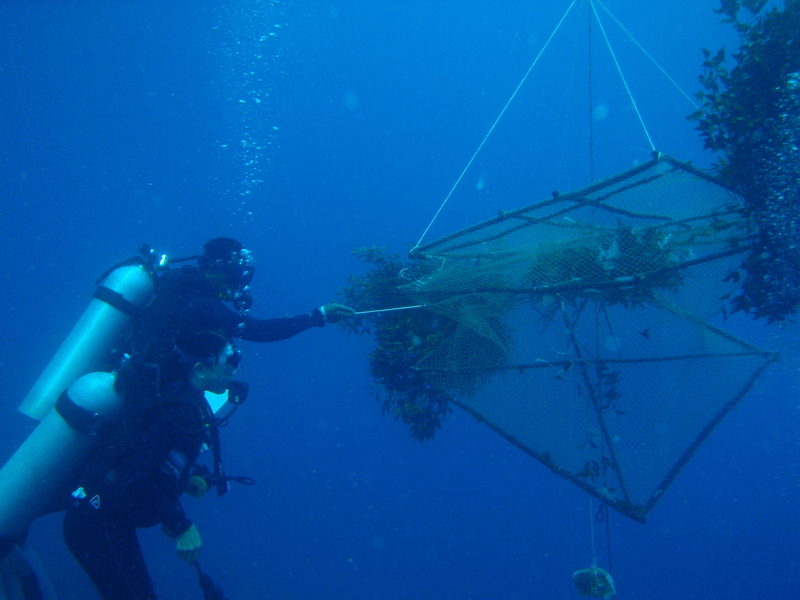 The notion of visiting it this year is somewhat remote as it was only an alternate for Tubbataha 2010. Then last minute we deferred our coveted dive trip, and hastily arranged our schedules for our mid-year trip to this enchanting quaint town at the northern part of the Last Frontier. The arrangements were not easy – evaluating the possible routes required longer leave from work and it made me cringe since being away on month ends must be avoided as I was warned. Both Angel and I crossed our fingers, and when it was approved with no questions asked I was elated but tried not to spill any hint of excitement! My tickets were squeezed too to get easier course and ended up more costly compared to early-purchased ones. 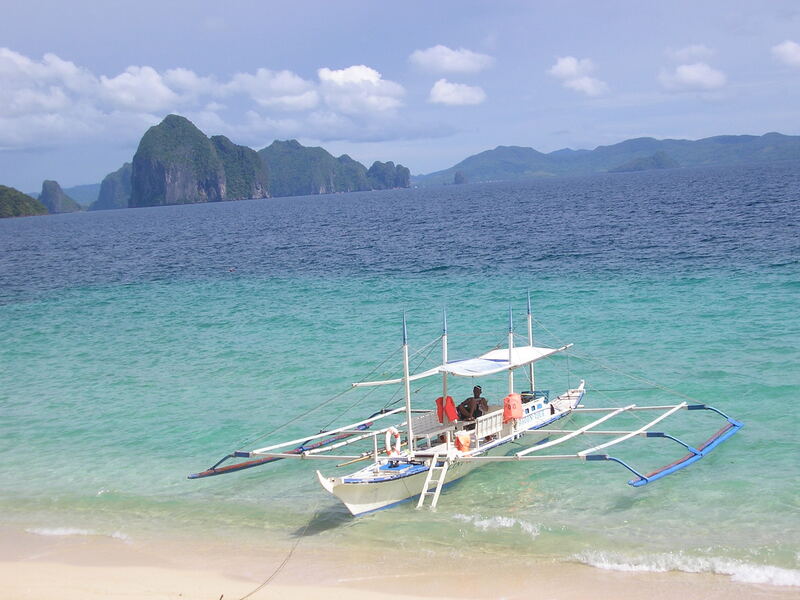 We carefully planned our itinerary believing the place has much to offer and we need to make most of our time, after all we have three full days to explore El Nido, not to mention two days of travel time. As usual I sneak home one Thursday morning as I have to catch up my early flight to Cebu hoping again I would bump no one I knew at the airport but as I queue up to check-in, somebody was beaming calling me. Of all the people, executives from BFAR whom I knew well! So the usual questions, they were delighted I’m heading for a dive trip, knowing me with subdued traits it was surprising for them I became passionate with the marine world. We parted ways as they were on another plane. I found myself seated between two men on my flight to Cebu, it felt stupid why I didn’t ask for a window seat. I waited for more than two hours for my next flight and we touched down Puerto Princesa as scheduled with Angel waiting for over an hour, we rushed to Fort Wally terminal as the van has been waiting for us. My mind considering possibilities as I got a message earlier from Seair that my flight was cancelled! We resolved to settle things when we arrive in our destination. In a little while, we left and set off for the long trip about 238 kilometers away. The heat was scorching! Somehow I was surprised that the roads are paved far from what I conceived as dusty and potholed, stories I heard told me going up north are all rough roads! Until we reached Roxas two hours later for our lunch stop, it was all smooth. On our way, I was trying to search for a rainbow, pressing my nose on the glass windows but found none, but was relieved when it appeared on the west side with its end just beyond the field! I always took rainbows as sign of a wonderful trip which Angel also affirmed. As we passed the towns of San Vicente and Taytay, there were still road works and estimated to be 70% completed until El Nido. Our vehicle had a breakdown about 40 kilometers away before finally reaching our destination, delaying our arrival past 6pm. 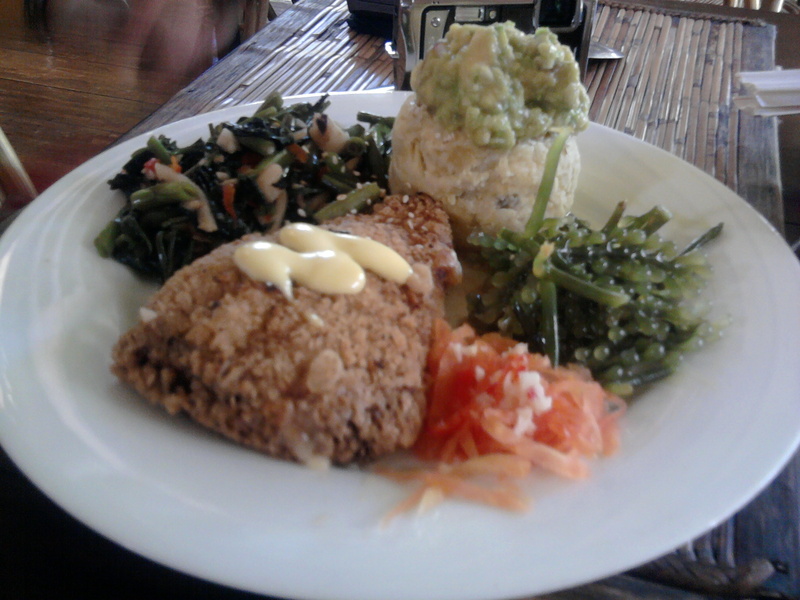 We settled at Lualhati Cottages, a place farther away from downtown but still walking distance. It’s a quiet place with garden and fruit trees around, a comfy and decent dwellings which Angel and I liked. Few days earlier we agreed to find some place overlooking the bay to get a sunset view every day, it would be so wonderful! 🙂 We went for a walk downtown: buy some needs, had dinner at a carenderia, went to the beach front and search Og’s Pension to check their rooms. The beach front was in festive mood as lot of people was night swimming perhaps because it’s the feast of St. John the Baptist. We walked the whole stretch trying to get the El Nido night atmosphere – there were restos, bar, lodge, inns and beach hotels lining up – like any beach front it offered a lot of dwellings to pass the night by. One thing I like when in a holiday in a strange place, I can wear anything (modestly, of course) without worrying somebody I knew would catch me, dress code and decorum at the office is sometimes drastic! 😛 Angel and I discussed where to dine in the next three evenings to wind up our day’s events! We tried to remember landmarks as it would be our path in the next days. We got back to our lodge thankful it’s just ideal to our liking – I can hear the crickets, night bird and house lizard sounds – environment friendly still! We doze off finally, it’s been a long day and the morrow’s schedule requires much energy! We check in at Palawan Divers the next morning before 8am as instructed, earlier I was trying to negotiate for a 3-dive trip to maximize time but not promising although they will consider if other divers will sign in, no other bookings yet at that time as informed. I was getting excited as it has been more than two months since I last dove with Angel at Kalanggaman Island. So, when I asked GM Yoshi and Ms. Abby if we can have 3 dives, Angel and I was thrilled when they showed us the plan for the three spots! 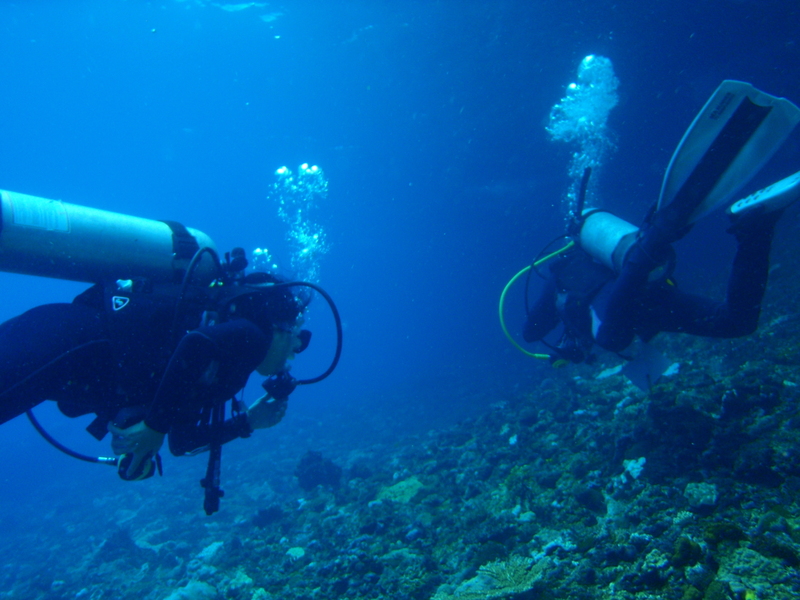 😀 Other divers can just snorkel around while we do the third descent. After we signed up, briefing, review of hand signals with DM Windel, other divers came. Malcolm, Paddi & Heidi are Britons while Rafael is French – all foreigners! Might as well worthwhile to mention that in all our dives, foreigners are regulars (mostly Europeans) and they too are wondering why locals are not so much into diving. Somewhat the skies are downcast, an advantage actually since the heat will be minimal. We cruise the bay for or first descent at Abdeens Reef, Angel and I was with DM Windel and Malcolm. We did the roll-back entry, it felt so good to be back in the waters! When we got down, our first sighting was the garden eel – we stayed for awhile getting a good view while it tried to come out almost thirds trying to observe us perhaps! And again, the feeling of belonging to the marine world engulfed me – so beautiful, so serene… Then suddenly a school of stripe fish appeared, camouflaging as big fish – such a rare sight! DM Windel was so keen on macros, we search on corals, crinoids, rocks for shrimp, small crabs, and lot of tiny colorful nudis. Tropical fishes abound at the reef – butterfly, bat, angels, banners, damsels, surgeons, rabbit, anemonefish, barramundi, anthias, moorish idol, lionfish and a moray under a coral. Somewhere along while we get shallower, I was struggling to control my buoyancy so one kilo weights was added for me which made me more stable while doing the safety stop. After 63 minutes, we ascend with 40 bars of my air left. After an hour of interval, we cruise shortly to Paglugaban Rock for our second descent, we went down at 21.8 meters as deepest and again there was an array of fishes, critters, corals plus rock formations. We went into alley-like formations, ship front and boulders. Suddenly, we heard an explosion, looking around we wondered what it was! We found out later from DM Windel it was some dynamite explosion – what, in broad daylight? In a marine protected area? By law, El Nido (MNR AO # 518 expanded by DENR AO # 14 s. of 1992; Proclamation #32 is now at congress) is protected, terrestrial or coastal. How ridiculous! Nonsensical – how far have they gone in destroying this paradise? After awhile, we went around though and there was anemones again, lionfish, porcupine fish, unicorn, parrots, triggers, puffers, butterfly, a lobster, colorful nudis and variety of hard corals. We ascend after 73 minutes with 30 bars of my air left. I was wondering if the fishers got all the catch they wanted after the blast, have they realized the extent of damage done on the marine environment? It started to drizzle as we speed off to Entalula Island for our late lunch, there was a patch of white beach and we anchored there for our stop. We took refuge under a tree and took our meals leisurely talking and Ms Abby telling us stories about this small quaint town. We just sat on the sand surrounding an improvised low table (Japanese style) bidding our time. Squid eggs hanging on at the cage! We sailed off back to town still drizzling grateful for the great marine encounters of the day. GM Yoshi commented it’s unusual for them to have three long dives in a day! Before we could call the day off at the diveshop, DM Windel discussed with us the species we got into and we learned so many things from him. We roam the streets looking for a place to dine, we retraced our steps and settled at Lonesome Carabao Lounge which was just near the diveshop. Fortunately, the rains have stopped already and after our relaxed dinner we walked back to our lodge. It was such a long day, and after rinsing our gears we surrendered to the comfort of our beds. There was no sunset today…. 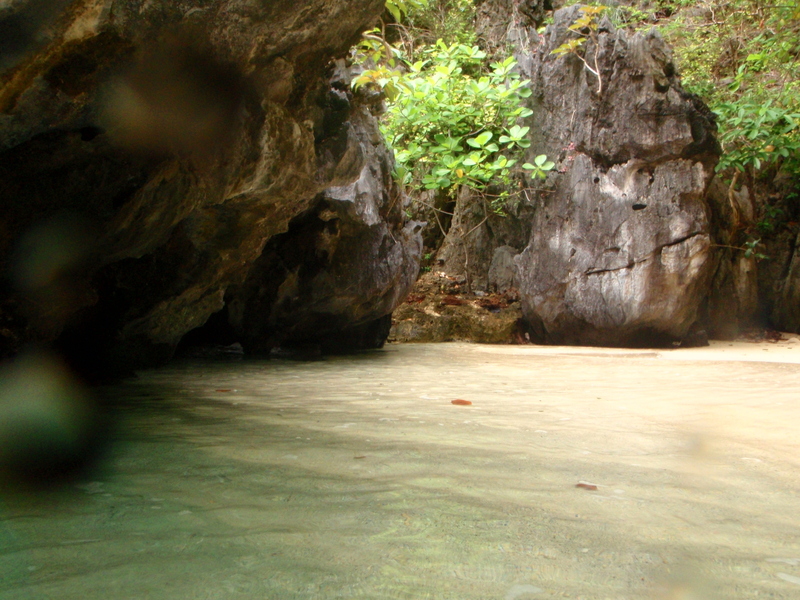 The next two days was devoted for island hopping and snorkeling and what a joy – I just love the waters! 🙂 On our second day, we explored Small Lagoon and Big Lagoon at Miniloc Island. 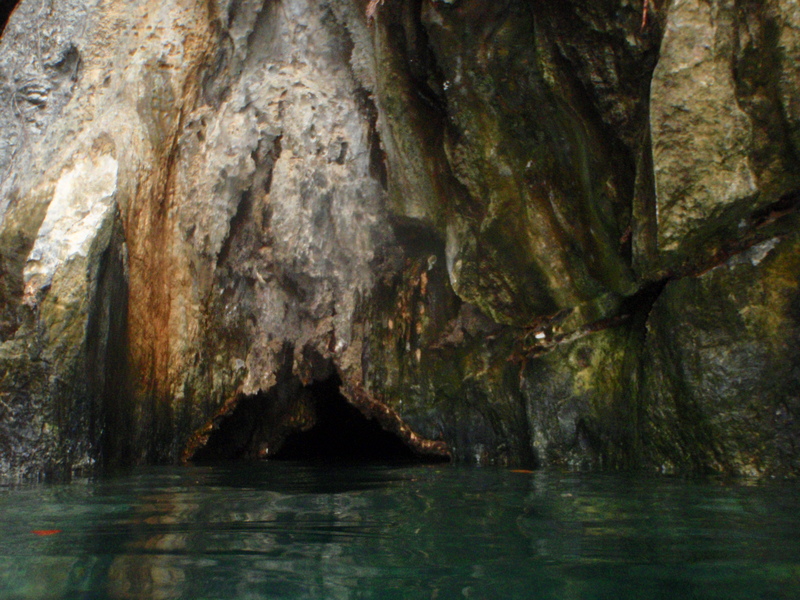 We swam and snorkeled to get into the small lagoon, there were many kayakers inside but we wade to the innermost corner to explore a small cave. There were formations inside, you can get a good view as you swam around the waters inside but there was less fish life. We hop next to big lagoon cruising around, the two Koreans in our company was simply amazed of the sights, perhaps they were attracted with the limestone cliffs. We cruised to Payong-payong Beach for our lunch, a small white beach near Miniloc Island Beach Resort. We snorkeled round while waiting for our lunch, I had the opportunity to observe a school of parrots & triggers feeding on dead corals, I learned that they are capable of producing cu. ft of sand in a year! We had a sumptuous lunch of grilled snappers and pork chop with veggie salad, having a good view of the resort but to me it looks gloomy and ominous. We hop next to Shimizu Island (named after two Japanese brothers who died while diving due to air loss), there’s a white beach again but what was most interesting was the active fish life in the area. We snorkeled and even without food, throng of sergeants, six bar wrasse and damsels gather around on you, it was simply marvelous! The next morning we attended Sunday mass at St. Francis of Assissi church as our first agenda of the day and later rushed back to our lodge to prepare for our last day of exploring Bacuit archipelago. We found again the two Koreans plus a French couple joined with us for the tour. 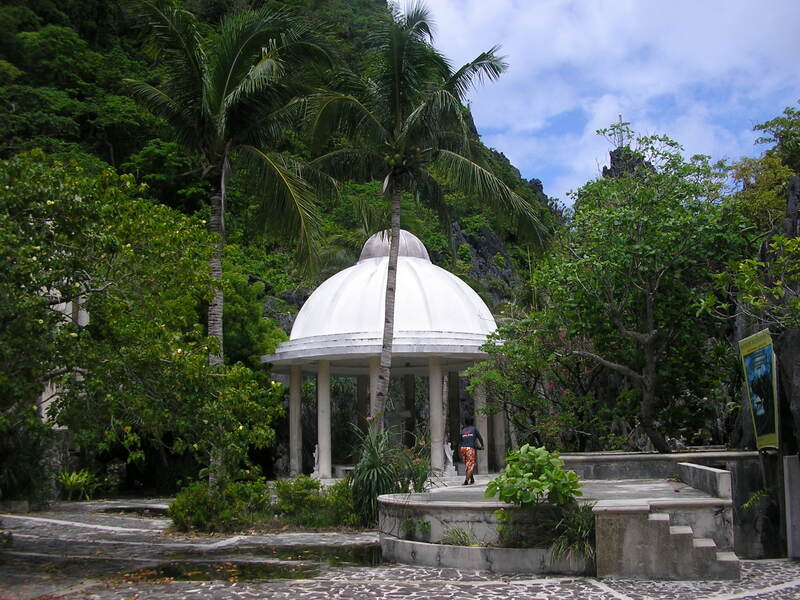 We cruised for Matinloc Island which led us to our first stop at Hidden Beach – another small patch of white beach hidden among the limestone cliffs. We swam again and snorkeled a bit just trying to observe the underwater scene. We cruised next to Secret Beach which the waters become choppy when we got near the area. It was bit challenging, with the raging waters we swam to a small entrance at the rock cliff, must be careful not to be swept by the big waves. But when you get inside, it seems another place – crystal calm waters, white sands, lush vegetations, rock cliffs – all so natural and serene. We stayed awhile swimming and enjoying the scenery inside the little paradise. We swam back again the raging waters back to the boat. in shallow waters near the port which darkens the area – such rich resources! We did a side trip to Kulasa Beach for fish feeding and snorkeling again. Fish life was active – trumpet fishes, damsels, anthias, sergeants, and anemones too. Our last stop for the day was at Helicopter Island (because It looks like helicopter at a distance), it has a long stretch of white beach, crystal waters, reefs, rich fish life even in shallow waters and idyllic setting. I snorkeled again viewing the underwater in all its splendor, soon I’ll be missing all these and I just wanted to immerse myself in all its perfection. We woke up earlier the next morning and finished packing – always I have a lot of stuff to pack! With the cancellation of my El Nido-Manila flight, I ended up going to Puerto Princesa with Angel and joined him in his Zest Air flight to Manila in the afternoon. We got into Fort Wally van again on our way back and reached Puerto a little past 12 noon. We wanted to treat ourselves with a sumptous lunch, gladly we ended up at Ka Lui Restaurant after asking the tricycle driver for a good resto in the city.